An impostor has been impersonating Courtney Ryley Cooper and Jack Boyle and these two writers have sent a printed circular of warning to editors. They describe the man as six feet tall, with long hair brushed back from his forehead and strongly resembling Raymond Hitchcock in mannerism, cast of countenance, and general build, especially in size and shape of mouth and chin. His name is not known … The Cooper-Boyle man is reported as having worked in Los Angeles, Pittsburgh, Texas, and the South in general, passing bad checks, etc. That an impostor scammed money by passing bad checks in Jack Boyle’s name is ironic, as the real Boyle was arrested several times over the years for actually committing that particular crime himself. Likewise, it’s interesting that someone should assume the identity of Jack Boyle in the 1920s, as he had been party to a literary imposture just seven years earlier. In 1914, Boyle was granted early parole from the Canon City Penitentiary in Colorado, largely due to the efforts of celebrated San Francisco author Rufus Steele, who was visiting Denver at the time. Upon his release, Boyle secured employment with THE SUNLIGHT MAGAZINE, a newly-founded Denver publication, and soon was able to convince author Steele to submit stories and articles to the fledgling magazine to help establish a readership. The endeavor collapsed in a matter of weeks, however, when it was revealed that the man calling himself “Rufus” Steele was, in fact, a charlatan named Wililam F. Steele, who had been travelling the country impersonating the well-known west coast writer. Boyle claimed to be ignorant of the deception, but did admit that he had written everything appearing in THE SUNLIGHT under Steele’s byline. So, in 1914 Jack Boyle was “innocently” involved in the theft of another writer’s identity, though accounts from the period identify the impostor himself as William F. Steele. Strange that Boyle should be party to a literary imposture, only to have his own identity stolen in a similar circumstance by an unknown fraudster just a few years later. Or is the impostor so unknown? The man pictured on the left above is actor Raymond Hitchcock, a popular performer on the silent screen. The 1921 announcement in THE WRITER says that the man impersonating Boyle bore a resemblance to Hitchcock in countenance and build. 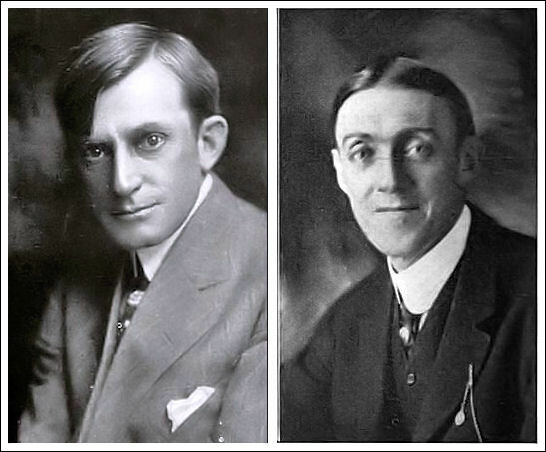 Pictured on the right is is William F. Steele, known literary impostor who passed himself off as Rufus Steele on multiple occasions, both before and after his association with Jack Boyle. While the two are not identical, there is a more than passing resemblance between them. Can it be mere coincidence that Boyle’s identity was stolen by a man who resembled Raymond Hitchcock, when he had previously been associated with just such a man in a scheme to impersonate a well-known writer? While the connection is unlikely to ever be definitively proven at this late date, a visual comparison certainly suggests that William F. Steele probably expanded the scope of his literary impersonations to trade off the celebrity of his old crony Jack Boyle. Since this is all merely educated speculation, whether or not Boyle suspected the identity of his impersonator is open to debate. But given that the Denver newspapers reported a falling out between the pair in 1914 which culminated in Boyle giving Steele a public beating, I suspect I can guess the outcome had Jack encountered his old friend again in 1921.